An Oklahoma woman bragged to a man on a dating app about poaching deer. He was a game warden. A white-tailed deer stands at the edge of the woods in Lily Bay State Park in the town of Beaver Cove near Greenville, May 14, 2016. As a game warden for Oklahoma’s Department of Wildlife Conservation, Cannon Harrison is used to working on investigations that take months and months. Catching poachers — whose illegal deeds often take place under the cover of night, in remote areas far from any road — frequently means relying on anonymous tips, conducting surveillance in small planes and collecting footage from hunters’ trail cameras. His latest bust, however, came easily — courtesy of the dating app Bumble. The 24-year-old received a notification in December telling him that he had matched with a woman in his area. After she messaged him to say hello — unlike other dating apps, Bumble requires women to make the first move — Harrison asked how she was doing. She had just shot a “bigo buck,” she told him — a big old buck. “Pretty happy about it,” she wrote. At first, Harrison figured it had to be a prank. His profile on the dating app doesn’t mention what he does for a living. But in rural McIntosh County, a community of roughly 20,000 residents where he’s worked since 2017, plenty of people recognize him as the game warden. Still, he decided to play along. The season in which licensed Oklahoma residents can hunt deer with a rifle had already ended. Shooting the deer with a crossbow would have been legal, however, assuming that the woman had done everything else by the book. “Hell yeah, get em with a bow?” he wrote back. Harrison inquired if the woman had been spotlighting — a term that refers to shining a bright light into the animal’s eyes, creating a literal deer-in-the-headlights effect. Also sometimes referred to as “spotting” or “headlighting,” the practice is illegal in Oklahoma. Considered by some hunters to be unsportsmanlike, it also raises safety concerns since spotlighters may not be able to see as far as they shoot. “Yeahhhh,” the woman replied. She told him she had shot the deer on her ranch. “Got a pic?” he inquired. She sent him a photo of herself crouched next to a dead deer, holding up its antlers. A bright light — potentially a camera flash, but also possibly a spotlight — illuminated the nighttime scene. The conversation ended there. Armed only with the woman’s first name, a photo and a rough sense of her location, Harrison searched through social media until he had figured out her identity. The next morning, game wardens showed up at her home. 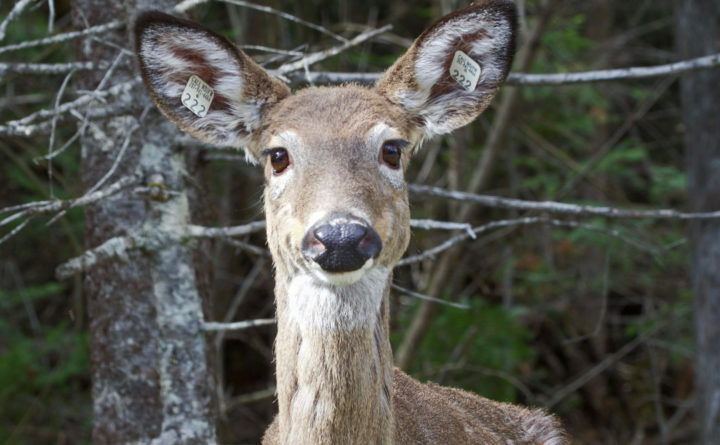 The woman ultimately pleaded guilty to hunting deer out of season and possessing game that was taken illegally, Harrison said. Wildlife conservation officials have chosen not to release her name at this time, but on Sunday, they posted the gory photos of the decapitated deer and images from the Bumble conversation on the Oklahoma Game Wardens Facebook page, to the amusement of commenters who pointed out that the buck wasn’t even that big. “Only in Oklahoma would a woman brag about killing a deer on a dating app,” one woman wrote. “Instead of date night with a spotlight she got a biggo ticket,” another commenter added. That ticket added up to $2,400, according to the Tulsa World — a total that also includes the fines incurred by a man who had been out hunting with her and took home the buck’s head afterward. Because the woman has agreed to pay her share of the fines, she will not face jail time, Harrison said. Game wardens in the western United States have long been stymied by tightening budgets and limited resources, as High Country News has reported. Often, a single officer will be responsible for patrolling hundreds or even thousands of miles of territory. But social media has made their jobs easier in one respect, since poachers routinely feel compelled to brag about their trophies and end up incriminating themselves online. Bill Hale, who heads up the law enforcement division at the Oklahoma Department of Wildlife, told the Tulsa World that the agency typically busts two or three poachers each year because of ill-advised posts on social media.